The airport full body scanner is estimated to be USD 79.0 Million in 2016 and is projected to reach USD 118.2 million by 2021, at a CAGR of 8.40% during the forecast period. The base year considered for the study is 2016 and the forecast period is from 2017 to 2021. The report analyzes the airport full body scanner on the basis of airport type (A, B, C), technology (Milimeter wave scanner, backscatter ), and region (North America, Europe, Asia-Pacific, and RoW). 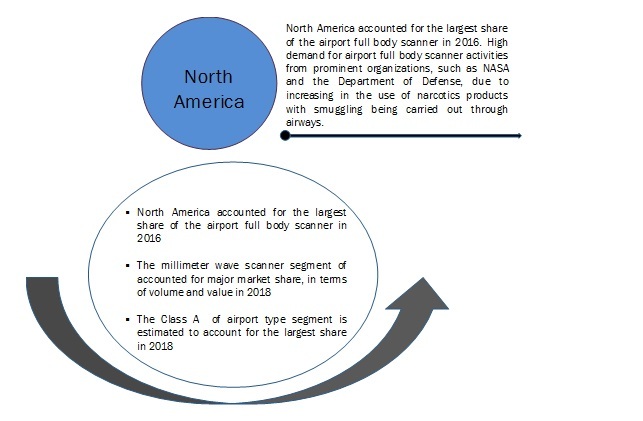 The report provides in-depth market intelligence regarding the airport full body scanner and major factors, including drivers, restraints, opportunities, and challenges that may influence the growth of the market. It also provides an analysis of micromarkets with respect to individual growth trends, growth prospects, and their contribution to the overall market. 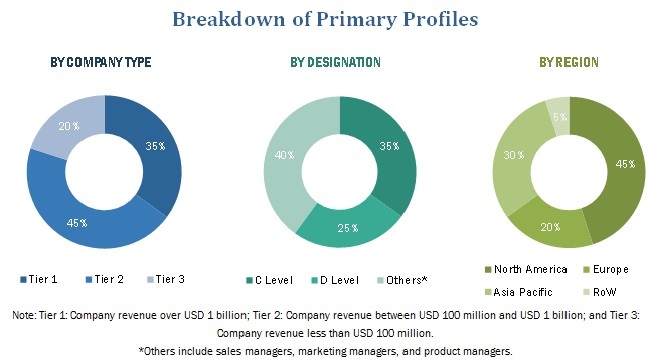 The report also covers competitive developments such as long-term contracts, new product launches and developments, and research & development activities in the full body scanner market, in addition to business and corporate strategies adopted by key market players. Airport full body scanner and its subsegment was arrived by referring to varied secondary sources, such as Hoovers, Bloomberg Businessweek, Factiva, annual reports, and publications, among others. Furthermore, market triangulation was performed with the help of statistical techniques using econometric tools. All percentage shares, splits, and breakdowns were determined using secondary sources and verified through primary sources. All possible parameters that affect the market have been accounted for, viewed in extensive detail, verified through primary research, and analyzed to acquire the final quantitative and qualitative data. This data was consolidated with detailed inputs and analysis from MarketsandMarkets, and presented in this report. The ecosystem of the airport full body scanner comprises airport authorities, airport full body scanner manufacturer, service providers, software providers, and end users. The key players in the airport full body scanner market include Smiths Group PLC (U.K), L-3 Communications Holdings, Inc. (U.S), American Science & Engineering Group (U.S.), Rapiscan Systems Ltd.(U.S.) , Tek84 Engineering Group LLC(U.S.) , Millivision Inc. (U.S.) CST Digital Communications (South Africa), and Safran Morpho (France), among others. Base on technology, airport full body scanner is segmented into millimeter wave scanner,and backsactter X ray Service. Millimeter wave scanner is futher segmented into activ and passive sacanner. These scanners have high demand because of its high speed, safety, high sensitivity, and 3D high-resolution proficiency.This scanner can be used for screening concealed objects and potential threats without any interruption of smooth flow of traffic in airports, train stations, customs/immigration checkpoints and commuter terminals. These scanners are also used in military, government offices and institutions, and corporate/private security where there is a possibility of threats. How will the airport full body scanner market drivers, restraints and future opportunities affect the market dynamics and subsequent market analysis of the associated trends. The full body scanner is going through human body safety concern, when will this scenario ease out? What are the key sustainability strategies adopted by airport full body scanner market players? How are the industry players addressing this challenge? The airport full body scanner market is projected to grow to USD 118.27 million by 2021, at a CAGR of 8.40% during the forecast period. This growth can be attributed to the increasing terror attacks at airports and also the increasing investments in R&D for enhanced full body scanners. The full body scanner market has been segmented based on airport type, technology, and region. Based on technology, the market has been segmented into millimeter-wave systems and backscatter systems. 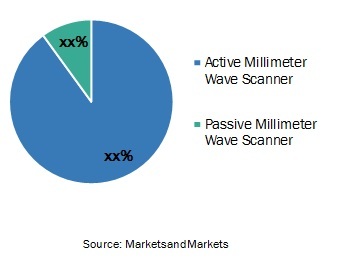 The millimeter-wave systems segment is projected to lead to grow at the highest CAGR from 2016 to 2021. This growth is mainly attributed to the wide installation of these systems in place of backscatter systems. Backscatter systems have the drawback of emitting low-energy X-rays that bounce off a passenger's body which increase the possibility of cancer, and other skin diseases in the human body. Based on region, the full body scanner market has been segmented into North America, Europe, Asia-Pacific, and the Rest of the World (RoW). North America is projected to lead the full body scanner market during the forecast period. The full body scanner market in Europe and Asia-Pacific is expected to witness high growth, owing to the regulatory mandates for the installation of full body scanners in Europe and the increase in terrorist activities in the Asia-Pacific. Many-a-times, it was found that the machine could not detect explosives carried by a terrorist and he was able to pass through a Rapiscan’s X-ray Backscatter scanner. This has been the major weakness of the scanner. Due to this, the company may lose its contract with airport authorities. Many researches has been carried out by the scientists about the ineffectiveness of these scanners. Companies who are into manufacturing of airport full body scanners are investing huge amount of money into R&D so that they are able to solve this problem of the machines. They have to make products that are able to detect explosives that are kept under the cavity or are carried inside a human body. The North American region is the largest market for airport full body scanner. The region has been a pioneer in adapting new technologies and has been one of the lucrative markets for technological investments. It is also the fastest-growing market, due to the high risk of security threats and criminal activities. 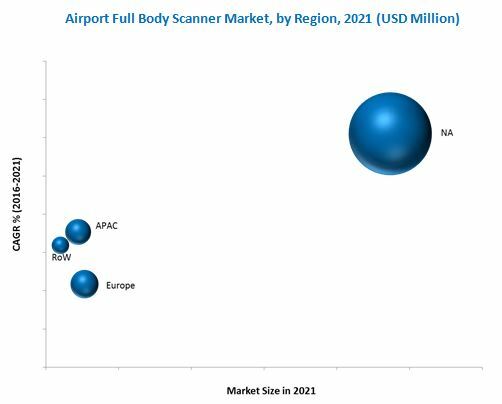 The Europe and Asia Pacific held considerable share in the airport full body scanner market in 2016. Middle East, latin America and Africa are the key regions considered under the Rest of the World (RoW). Companies such as Smith Group Plc (U.K.), L-3 Technologies Inc (U.S.), Rapiscan Systems (U.S), American Scienice & engineering Group, Tek84 among others, are develop airport full body scanner. Worldwide adoption of airport full body scanner to prevent terror attack and drug trafficking shows the importance of these scanners. For instance, in 2016, Rapiscan systems(U.S.) developed MP100 backpack radiation detections systems, lightweight, high-performance solution that can detect radiological and nuclear materials and is housed within a compact commercial backpack. Backscatter full body scanners use low-intensity X-rays to scan passengers. The waves are bounced back or backscattered and captured by the detectors are placed on the same side of the full body scanner to create images of the subject within a few seconds. Backscatter systems use narrow X-ray beams to scan subjects at high speed. X-rays are relatively low energy and can penetrate through the clothing of the subject. As majority of these waves bounce off the skin surface, they are only useful for imaging objects hidden under the clothing or taped to the skin of the subject. They cannot detect objects hidden inside the body. Backscatter systems make use of these bounced off rays to identify dangerous objects. The amount of radiation to which a person is exposed is insignificant to cause any health risk. A typical backscatter scan consists of two images, front and back. Backscatter full body scanners are growing at a moderate pace, as airports such as John F. Kennedy International Airport (U.S.), Boise Airport (U.S.) and Boston Logan International Airport (U.S.) are using them for screening processes. Millimeter waves refer to an electromagnetic spectrum that lies between radio waves and infrared waves. Millimeter wave systems project low-level radio frequency energy around the body of the subject to detect objects concealed under the clothing. Exposure to millimeter waves is harmless. These waves are then sent back to a transceiver from where they are further sent to a high-speed computer. This high-speed computer reconstructs the signals to create final 3D holographic images. 11.3 L-3 Communications Holdings, Inc.